← Everything You Probably Don't Know But Need To Know About The Updated 2019 TVC Han Solo (Echo Base) (VC03) Figure! The Saga Collection’s first wave of vehicles contained four vehicles from the Revenge Of The Sith line. Let’s look at Anakin’s Jedi Starfighter. It’s the focus of our Research Droids Reviews today! Be sure to leave your thoughts in our comments section, vote in the poll or comment about it on our Facebook page. Click the banner below for the direct link to the review! As always, you can also send your review requests via email if you’d like to see something that we didn’t cover yet. ← Walmart Exclusive TVC Stormtrooper (Mimban) BACK IN STOCK! Did you know that the Clone Wars Jedi Starfighter comes with R2-C4 from The Phantom Menace? It’s true. See more in our Research Droids Reviews today! Be sure to leave your thoughts in our comments section, vote in the poll or comment about it on our Facebook page. Click the banner below for the direct link to the review! As always, you can also send your review requests via email if you’d like to see something that we didn’t cover yet. OK, here’s a great figure. But did it need to be repackaged so soon and be more expensive than it was previously. Let’s check out the R2-D2 (The Astromech) figure from the Galaxy Of Adventures line in our Research Droids Reviews today! Be sure to leave your thoughts in our comments section, vote in the poll or even comment about it on our Facebook page. Click the banner below for the direct link to the review! As always, you can also send your review requests via email if you’d like to see something that we didn’t cover yet. DON’T FORGET TO CLICK THE COIN to see what happens! We are ecstatic to continue with our uninterrupted run of the final wave of vintage Kenner figures which we’re calling “The Final Countdown.” These 15 action figures make up Kenner’s THE POWER OF THE FORCE series 8 figures. Let’s keep things going with Artoo-Detoo (R2-D2) (with pop-up Lightsaber). Relive your memories of this classic 1985 action figure in our Research Droids Reviews today. Be sure to add your own experiences to the conversation! Reminisce your own childhood stories of this figure in our comments. Share your life-changing vintage Kenner adolescent experiences with us! 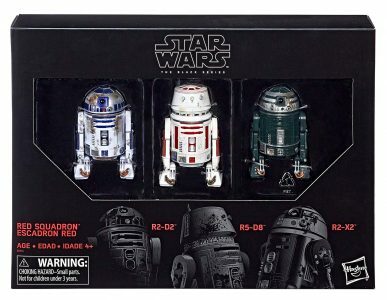 We just received our sample of The Black Series [Phase III] 6″ Red Squadron three-pack of astromech droids. Forgetting that these sculpts are terribly out of scale, the set comes off as a genuinely nice effort. We have one major problem, however, R2-X2 has a white dome, NOT a silver one. This is deco basics, and we’re very disappointed Hasbro screwed this up. They did nail the deco on R5-D8 and took into consideration all of the differences that set it apart from R5-D4 (which is something they completely botched on the 3.75″ version). The battle-damaged R2-D2 looks good, but a true retooling will be required before it’s screen-accurate to the blasts he received during the Battle of Yavin. (Remember the 2008 TAC Luke Skywalker/R2-D2 Droid Factory set? That’s what Hasbro has to do to the 6″ version of R2-D2.) Aside from the figures suffering from too small of a scale, the set is costly. These three small figures will set you back over $60 with tax. Anyway, click through to check out this fun set. We’re continuing to add the fabulous vintage Kenner Star Wars action figures to our Research Droids Reviews. Let’s continue the momentum with the Artoo-Detoo (R2-D2). Please reminisce with us as we talk about our life-changing vintage Kenner experiences. Disney comes through with droids from Solo: A Star Wars Story. Click below to check out our Visual Guide update featuring R2-F1P, R5-232, R2-S8, and R5-PHT. You can also read our full review of this set right here in our Research Droids Reviews database. The R2-F1P/R5-232/R2-S8/R5-PHT Droid Factory set is incredible. And the droids inside of this set have all received updates making them more accurate to screen than ever before. See why you don’t want to miss out on this set in our Research Droids Reviews today! Be sure to leave your thoughts in our comments section, vote in the poll or even comment about it on our Facebook page. Click the banner below for the direct link to the review! As always, you can also send your review requests via email if you’d like to see something that we didn’t cover yet. We have a sneak peek look for you tonight of the R2-F1P/R5-232/R2-S8/R5-PHT Solo: A Star Wars Story Droid Factory four-pack. It appears that we might see new Droid Factory droid parts in the future as evidenced by the new parts included here, namely the restraining bolts. R2-S8 is the standout astromech droid of the set (who looks a lot like R2-MK by the way) and has some of the best paint operations we have seen in this line to date. Still, all droids are still missing foot wires which is an ongoing setback. Check out this great set early in our RDRs by clicking the image below. ← Walmart Exclusive Funko Pop Bespin 3-Pack Now In Stock! Next up for our Star Wars [The Last Jedi] Visual Guide updates is R2-D2. Click below to check out the full guide for the latest version of R2-D2, and click here for a complete anaysis of this droid in today’s review. Wow! Hasbro brought back the Droid Factory Build A Droid sculpt into the basic figure line…. WITH IMPROVEMENTS! R2-D2 is an exciting release! Check him out in our Research Droids Reviews today! Be sure to leave your own thoughts in our comments section, vote in the poll or even leave comments about it on our Facebook page. Click the banner below for the direct link to the review! As always, you can also send your own personal review requests via email if you’d like to see something that we didn’t cover yet.